Since this is the third and final book in this trilogy I won't post the summary here, since it certainly contains spoilers, so head on over to goodreads if you want to read it. I was more than ready to love this book, hoped that the ending would live up to all the positive reviews I'd seen on YouTube and on goodreads from bloggers and booktubers I trust. But, unfortunately, I was left feeling disappointed and annoyed at a lot of what happened. I will try to talk about my opinions in a way that won't contain any spoilers, or at least I'll try. “I hope you weren't looking to me to be the voice of reason. Siege and Storm, the second book in this trilogy, already left me feeling more neutral and underwhelmed than I expected after I'd LOVED Shadow and Bone (review). I truly hoped that things would change in the finale, that the answers we'd hopefully get would make the mediocracy of the second book okay, but unfortunately that didn't happen. The beginning, as in about the first 100 pages or more, were very slow. There was just a lot of nothing, just some conversations, sitting around, thinking, some more conversations that didn't really amount to anything much. Then the plot finally picks up once Nikolai shows up. To be quite honest, Nikolai was the reason I didn't give up on Siege and Storm, and I hoped he would once more play a bigger role in this book, but that wasn't the case. We get a lot of tension between Alina and one of the main male characters, a lot of angst and emotional struggle, which I found just a bit annoying after a while, though not quite as bad as in Siege and Storm. Just as I hoped we did get some background informations that did explain some things, some relations between characters and history, and that was great. I liked how everything was tied together and how it certainly explained a few of the key things. It showed that all those things hadn't been just said along the way but that there'd been a purpose all along, hints that now finally made sense and created the big picture we'd waited for. Unfortunately the story did a great job of having amazing characters, and then just not using them, sending them away or other, and that was just really a shame. There were so many other ways in which those characters could've been used more effectively for a bigger impact than this. When the first major character related plot twist happened, I know we were all supposed to probably be shocked and sad, but I was just very annoyed. I liked that character, damn it. Ironically later down the line we had another major character twist (I'm avoiding actually saying what it was but I think once you'll read it you'll know what I mean) and, again, I'm pretty sure we were supposed to be sad, feel the pain of that event. Well, I don't know what it says about me, but I was pretty happy and smiled, though my happiness was short lived. 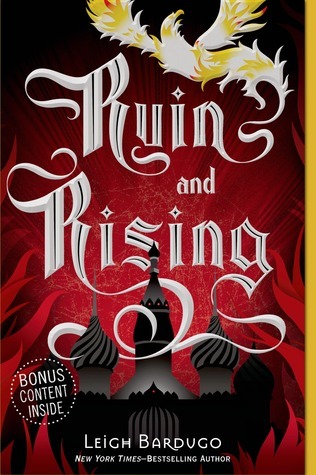 Then there is generally the ending of Ruin and Rising, and thus also the trilogy as a whole. Did I like it, did it live up to my expectations and leave me satisfied? Nope. I really didn't like the ending and I'm not sure if I feel like it made sense in the grand scheme of the characters but I know others loved it so theres that. 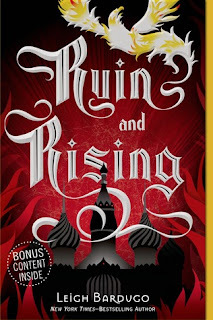 When I started Shadow and Bone I was in love with this world Leigh Bardugo had created and these really intricate characters, yet the ending of Ruin and Rising left me wondering if maybe I should've just stopped and only read Shadow and Bone. That isn't to say that Ruin and Rising, as well as Siege and Storm, didn't contain any awesome stuff, because they most certainly did. The writing was brilliant, the world building very interesting and (at least some of) the characters were well characterized and great to read about. Some of the secondary characters fell a bit flat and I probably didn't care about them as much as I should have. Speaking of which, let's talk about the main characters. Alina, who seemed like such a strong character most of the time, had so many emotional struggles because of a certain someone that I was just amazingly annoyed by (even more when I spoiled myself on with whom she would end up). Seeing darker sides manifest inside of her, this desire for more power, for something that the old her would've thought was wrong or too greedy, that was amazing. I loved how caring she was about the people she traveled with, her friends, and she tried to do whatever she could to save her country. In the end she was ready to sacrifice everything to do it, though I hated how torn she was. On one side she was ready to sacrifice so many people, but on the other side she wasn't ready to sacrifice a single specific one to save everyone else. HM. 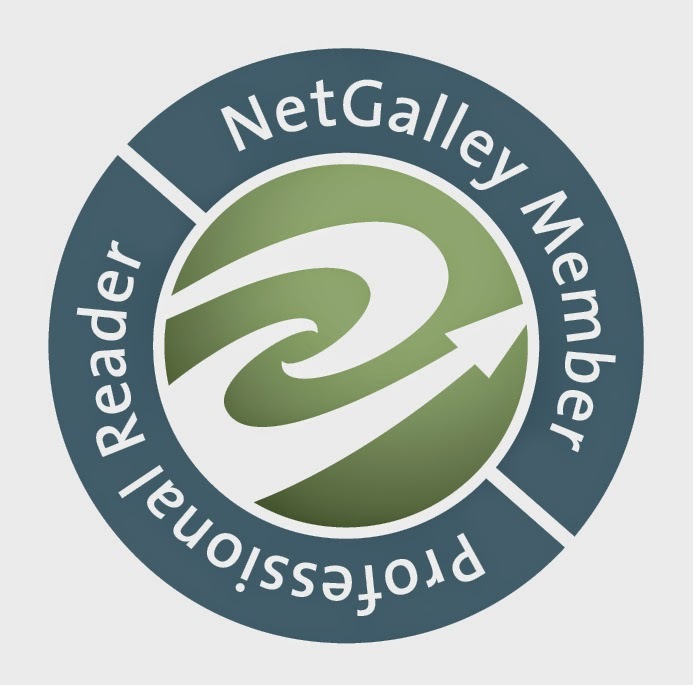 If you've followed my updates on goodreads you know that I REALLY didn't like Mal. From the moment on that it was said that he has feelings for Alina back in Shadow and Bone, until the very last page of Ruin and Rising. He was whiny, jealous, controlling, and sure he was a great tracker and he meant well, was ready to give his life for Alina, but most of the time I just wanted someone to punch him. He didn't fit in, he wasn't like Alina and the Grisha, and, wow, he truly had to obsess over that, behave so incredibly annoyingly because of it like your average typical 'I don't fit in with the crowd and I don't want to' teenager reminding us of that again and again. When it comes to his relationship with Alina, I truly felt like what they had was more of a best friends vibe, and not a romantic one, which was probably why I just couldn't with their romantic relationship. I felt like Alina had much better chemistry with other characters than with him. “You never know," said Nikolai. "I've been busy. I might have some surprises in store for the Darkling yet." Nikolai was simply brilliant, snarky, intelligent and just an overall fascinating character from the moment he entered the story until the very last page. I loved him and just whenever a scene contained him, whenever we saw him interact with Alina, it was just so much fun! I could honestly read an entire separate book just about him and his crazy adventures. Unfortunately I feel like his potential as character was completely wasted in Ruin and Rising which was a shame and, once again, left me annoyed. Then there was the Darkling, whose real name we've finally found out. As someone who usually favors the evil characters, I was quite fond of the Darkling. Yes, he was a horrible man who did horrible, unspeakable things, I am not denying that, but as character he was just incredibly intriguing and fascinating. He was so well characterized and had this certain something about him that I just loved. Did he deserve what he got? Hell yeah. All in all, even if Ruin and Rising left me ultimately disappointed and annoyed for the last 100 pages, it was still a good read and I enjoyed parts of it greatly. This is a great trilogy and probably the first fantasy trilogy I've enjoyed in a very long time. I adored the fact that Ravka was inspired by old Russia, though some of the last names drove me insane because they didn't follow the 'rules' for last names in Slav countries. If you're a Slav like me, Morozova would be a female for you, right, because of the -a ending. But in this universe it's a male last name, or maybe last names don't even make an ending distinction like they do in real life. ANYWAY, that isn't really important, just a little something I thought I'd mention. Oh and also all the traveling that happened in this story, that just got a bit boring after a while. Despite all of this I still recommend this trilogy, especially to people like me who usually don't really enjoy fantasy because this story doesn't contain any elves or witches or orcs or any of that. I give Ruin and Rising 3 Stars.